So I'm kinda laughing - because this says "Retro Arcade". Really is a Nintendo - Retro?? Geez. Okay so this is FUN! Retro Arcade Classic Entertainment Gaming Console with 600 Games $39.99 is the perfect gift for the hard to buy for men out there! 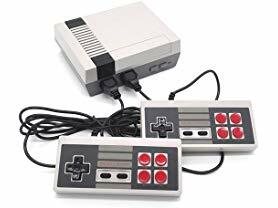 Bring the your childhood 8 bit nostolgia with retro arcades classic entertainment system that comes preloaded with 600 classic games and 2 controllers for multiplayer fun. This is an exact replica of your favorite classic entertainment cnosole that comes preloaded with many of your favorite classics. Classic Game Console: 8-bit console games, built-in 600 classic games, does not support game cards. Built-in 600 Games: 600 Childhood Classic TV Video Games, Universal for NTSC/PAL TV System.